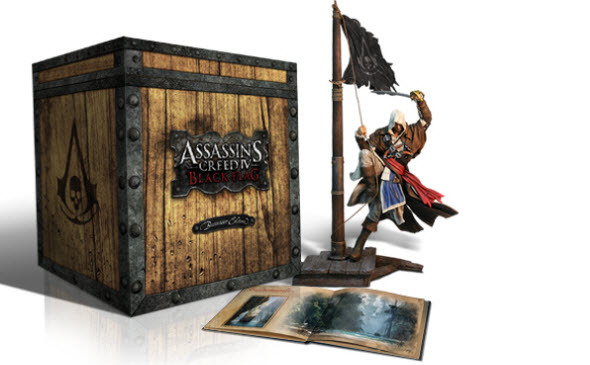 In spring the developers announced several collector's editions for Assassin's Creed 4. Among them there was The Buccaneer Edition with really interesting objects and digital items. An hour ago Ubisoft published new short trailer that demonstrates the content of this pack. We would like to remind you that The Buccaneer Edition includes beautiful and detailed Edward Kenway figurine, which represents our brave captain on the deck of his ship. Also in this pack you will find a brilliant art-book, official game's soundtrack and two lithographs. All these treasures are packed into a collector's box, and also the owners of the Assassin's Creed 4 edition will get some digital content: three missions for single-player and special items for multiplayer mode. If you want to find out more about The Buccaneer Edition, we advise you to watch the newest trailer that has been published today.